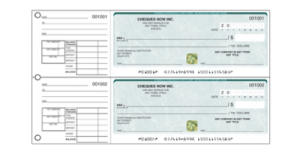 Print & Cheques Now is please to provide customers with 3 different cheque styles that can all be used as Personal Cheques. 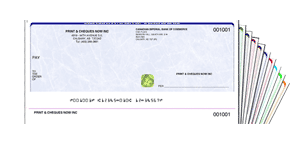 1) Laser / Computer printed cheques: These cheques are for individuals who use software programs such as Quicken to track there home and personal expenses. Programs such as Quicken, Sage 50 & Quickbooks provide customers the opportunity to enter the cheque details into the program and print cheques. 2) Business Style – Manual Hand written cheques come as either 1 cheque per page or 2 cheques per page. They have a stub on the left side where you can enter in any pertinent details about each cheque and carry forward account balances etc. Primarily used for busiensses but on larger qty’s they offer a huge cost savings! 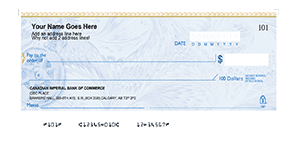 3) Wallet Size Personal Cheques – Most commonly used for personal use but can also be used for businesses. They are the smallest available cheque and makes them ideal for someone who always wants to carry cheques around with them. They are booked in 40’s and are only produced as single cheques. There is a transaction register in the back of each booklet where you can track your cheques, account balances etc.. Receive 50% MORE cheques when you order Personal Manual Business Cheques. Offering a complete range of quality Manual Cheques. Get 25% MORE cheques when you order Personal Laser Cheques. Our Laser Cheques have ultra high security features in Canada. Save on Personal Cheques today. Pay far less with Cheques Now than what your bank charges. We also offer overnight rush delivery. Please note that due to the smaller size of these cheques we are currently only able to print a 3 digit cheque #, so if your order 100+60 Free personal cheques starting at # 900.. the numbering will go up to 999 then the remainder will start over at 001. Receive 25% More FREE on every order.